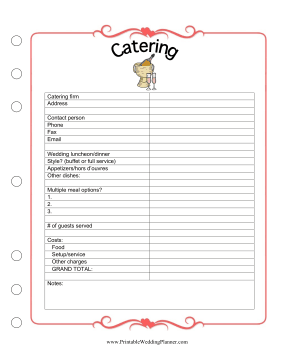 The Wedding Planner Catering worksheet helps you make sure everybody is fed. This Printable Wedding Planner is available to download for free, or you can download the entire collection for only $14.00. The free version is available in PDF format. It can be opened and printed with Adobe Acrobat Reader, or any other program that can display PDF files. The $5 version is in DOC format, which you can view, edit, and print with a compatible word processor. Just download it, enter your information to customize the form and fill it out, and print it. The $14 version includes all of the Printable Wedding Planners on this site, in DOC and PDF formats. After purchase, you can download them and use just a few wedding planners or the entire collection. If you don't see a wedding planner category that you want, please take a moment to let us know what you are looking for.